We’re sure you’re all eagerly awaiting the end of the hiatus. While we don’t have any news about that (though we’re still figuring it will probably be similar to last summer’s hiatus which ended in August), we do have some interesting information about the upcoming Guide to the Crystal Gems thanks to an interview Ms. Sugar did with io9 last week. 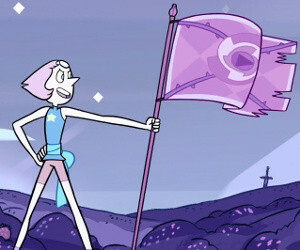 There’s a lot going on on the Gem Homeworld that he doesn’t know about at all, and a lot of rules that exist there that the Gems we know don’t follow! Steven’s going to learn a lot more soon on the show, about what each of the Crystal Gems are supposed to be… it’s very different than the way they’ve been living on Earth. It is very unusual for Gems like Garnet, Amethyst, and Pearl to be living and working together the way they do, almost as unusual as it is for Steven to exist! That’s some Big Deal stuff right there. Just the possibilities for how this information could be relayed to Steven are exciting, let alone actually learning it for ourselves. The book will be released in early October, so assuming that the hiatus does end in August (and again, while it did last year after starting in May, that’s just an assumption), that means that we’re going to get a big lore bomb dropped on us pretty quickly after the hiatus—we rather doubt that Cartoon Network would plan their schedule so that this information would be revealed in a peripheral. So brace yourselves: when the hiatus ends, the wait will have been so worth it. And I cannot wait to see where this goes. This could lead up to Planet of the Pearls being confirmed!